Some of the model kits from our collection. I was one lucky kid growing up. My father was in the auto body business and loved to change up his car every couple years. He restored a ’55 and ’57 Thunderbird, a ’65 Mustang convertible and a ’64 Plymouth Valiant Signet Convertible to name a few. My own first car was a ’70 Barracuda 318! (would kill to have that one back) We also have a great collection of model cars from kit makers all around the world. That was my real baptism into classic cars. 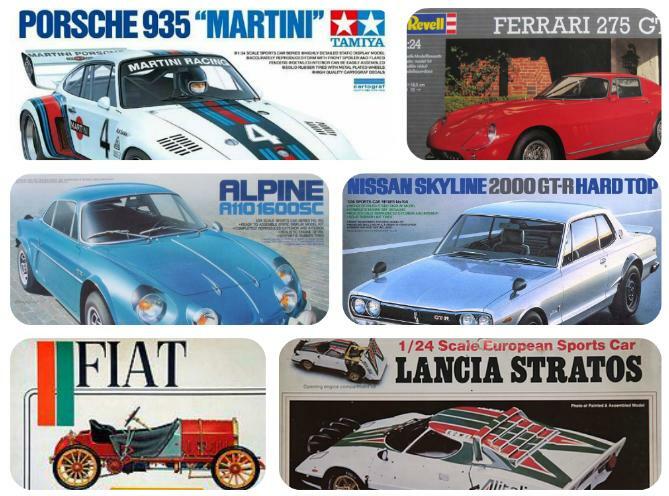 The collection had me learning names like Fiat F2, Lancia Stratos, Renault Alpine, Ferrari 275, Nissan Skyline and Porsche 935 long before my buddies started playing Gran Turismo on their Sony Playstations. I’m glad to have been able to learn of all the legendary imports at an early age…not to mention the countless American muscle classics. I’m still so curious about so many cars. I know this blog will keep my spark hot. This is my way of giving my Dad a big thanks in the early stages of my work here at Classic Fast. He is the one that got me started. Thanks for reading y’all! This entry was posted in Model Cars.